Photinus pyralis luciferase (FLuc, pGL4 derived). The brightest and most up to date version of this gene. Renilla reniformis luciferase (RLuc). Slightly smaller than FLuc and uses a different substrate. iLumena luciferase, secreted into the supernatant and uses the same substrate as RLuc. daGFP. A small, bright, synthetic fluorescent gene with similar properties to GFP. krYFP. A bright synthetic yellow fluorescence protein. frCFP. A bright synthetic cyan fluorescence protein. In the main multiple cloning site downstream of either yeast, bacterial or mammalian promoters. Under control of the Phosphoglycerate Kinase (PGK) promoter for expression in mammalian cells immediately after the main multiple cloning site. In these vectors you can insert an additional gene driven by a second promoter, and both genes use the same poly adenylation signal to terminate expression. Under the control of an internal ribosome entry site (EMCV IRES or FMDV IRES) for expression in mammalian cells. These can often demonstrate low, or variable activity depending on the sequence, cell line and upstream gene. Total protein content yields of 3-5% of the upstream gene are not uncommon, although 40-60% of cells may register as positive by transfection, depending on the reporter gene and the assay. Under the control of either the Rous Sarcoma Virus (RSV) promoter (low expression) or the Human Ubiquitin (Ub) promoter (high expression), where the entire expression cassette is inserted away from the main multiple cloning site, flanked by two AscI restriction sites to allow excision or exchange if needed. All of our constructs are designed for broad compatibility and versatile cloning, allowing you easily to produce any derivates you require. If you prefer to outsource the cloning work, we are happy to undertake it rapidly and efficiently. Beta-galactosidase is a hydrolase enzyme that catalyzes the hydrolysis of ß-galactosides into monosaccharides. It is a commonly used and versatile reporter gene, suitable for producing an enzymatic colour change during histology and also for activating fluorescent prodrugs for visualisation in flow cytometry. 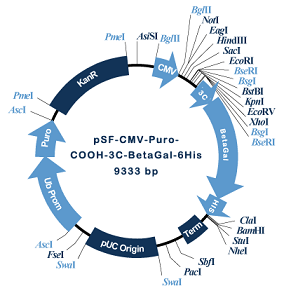 Beta-galactosidase also provides the basis for the blue/white screening of recombinant clones. This approach relies on the enzyme being divided into two inactive peptides, LacZa and LacZO. Enzyme activity is restored only when both are present in the same cell, as they spontaneously reassemble into a functional enzyme. This property is exploited in many cloning systems where the presence of the lacZa gene can complement another mutant gene encoding the LacZO. The presence of active ß-galactosidase is detected using X-gal, which produces a characteristic blue colour when cleaved by ß-galactosidase, thereby providing an easy means of distinguishing the presence of cloned product in a plasmid. ß-galactosidase from E. coli has 1024 amino acids and forms a 464 kDa homotetramer. Stop the reaction when adequate colour change has occurred, and read using spectrophotometer at 420 nm. Oxford Genetics provides a broad range of plasmids containing E. coli beta galactosidase in a variety of configurations, suitable for expression in mammalian cells, bacteria, yeast or insect cells. The structure shown encodes beta galactosidase downstream of the MCS, allowing you to insert your gene into the MCS and create an in-frame fusion protein with beta galactosidase. The 3C 'Prescission' site is also included, in case you wish to remove the reporter after protein production. This vector also contains Puromycin resistance driven by the ubiquitin promoter, for selection in mammalian cells, and kanamycin resistance for selection in bacterial cells. Many diverse plasmid structures are available from our online catalogue (see button below). Our Plasmid Builder facility also provides a simple means for you to design an efficient strategy for any modifications or cloning manipulations to these plasmids. Finally, as always, although we have designed these plasmids for simple and efficient cloning, we are happy to undertake any cloning steps that you prefer to outsource. You can access all these options through the Plasmid Builder’ button below. plasmids have no promoter driving the reporter gene, but they have several unique restriction sites that can be used to insert the promoter of your choice. contain the CMV enhancer upstream of the MCS, for your to insert your promoter of choice. The CMV enhancer should augment its activity.